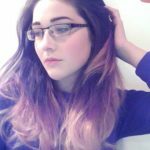 Are you struggling with thinning hair? 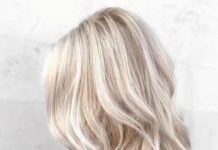 There are many factors that can contribute to this such as genetics, over manipulative styles, or even the type of products that you are using on your hair. No woman wants to walk around with thinning hair and guess what? You don’t have to. There are many styles that will not only camouflage your thinning hair but also help to grow it back because they are very easy on your hair and scalp. We suggest that while protecting your hair with these styles avoid heavy styling products. Opt for light oils and oils that promote hair growth such as castor oil, olive oil, and coconut oil. These oils will help to stimulate blood flow and lead to thicker growing hair. 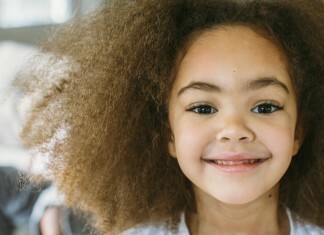 Another tip is too deep condition weekly to keep a natural moisture balance. 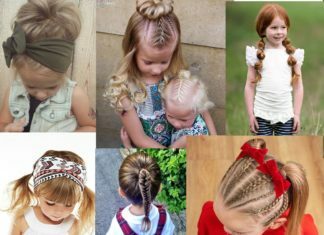 We have found 20 hairstyles for thin hair. Apply these styles and tips and achieve thicker hair. Here is a fringe cut with a side swept fringe bang. This style makes the hair appear thicker because of the light layers. If you have thin edges this style is perfect for you because there is no defined part. Next we have a simple neck length cut with a slightly teased crown. This style is complete with light and dark shades of brown. The darker brown root is great for making the hair appear thicker opposed to having a completely blonde look. How amazing is this auburn color? This is definitely a great color for the fall months. 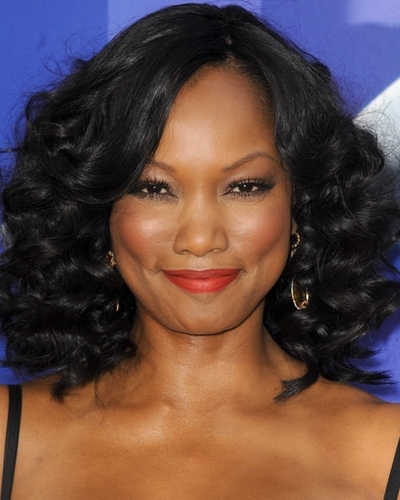 This style is perfect for thin hair because the light tousled waves make the hair appear thicker than it is. We usually go for thick bangs, but these thinner bangs work for this light look. Continuing with ponytails we have this fun side ponytail complemented with loose curls. This is perfect for those lazy days or those days where you just want to run errands and still be fab. 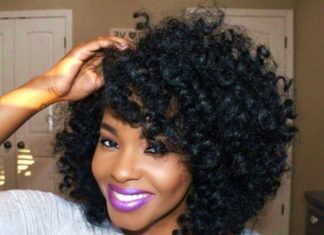 To get these loose curls add 2 sponge rollers so that you do not get overly curly hair. Can we take a moment to appreciate how laid Tyra Banks edges are? If you have medium length hair this style is perfect not only because it looks super elegant, but it is also a great protective style. It protects your ends and prevents breakage. Another great and also a great protective style are good old fashion cornrows. They do not require a lot of maintenance which is good if you have a demanding job or if you’re a busy college student. Because it is done with added hair it is perfect for thin hair. You can play with the color and length of this style. We are totally loving how healthy jet black makes your hair look. If you have thin hair jet black can make your hair appear fuller than it is. To complete the look add spiral curls and even dress it up with a bold red lip like Riri Woo. A little more on the classic style is this 60s inspired shoulder length style with a bang. To achieve this roller set your hair with small rollers and separate and fluff when you take down. Avoid heavy product to keep the fluffiness of this look which gives the illusion of fuller and thicker hair. Next we have this very cute A line bob. 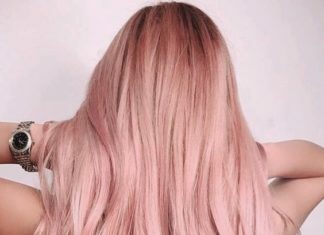 We love the light highlights and the slightly dark roots. To add “thickness” to your hair you can lightly tease the crown of your hair like the picture shows, or you can add hair extensions. If you are really into glitz, glam, long nails, and big hair then this is the perfect style for you. To achieve this grab your favorite teasing comb and a volumizing hairspray. Don’t like hairspray? here’s a secret use dry shampoo. Spray the roots of your hair only then tease this will give you volume but will also enable you to have body and movement. Put a twist on the boring old ponytail and go with a chic faux ponytail. We have seen many celebrities such as Nicki Minaj and Kate Beckinsale rocking the faux ponytail. You can dress it up or down depending on your choice of outfit. This has been a huge trend in 2015 and we do not see it going anywhere anytime soon. Here we have this beautiful twisted updo. 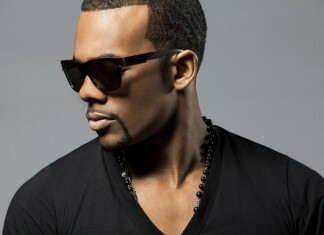 You can achieve this style by using added hair or wear your natural hair. Unlike braids, twist puts less strain on your hair which in return prevents unnecessary breakage. 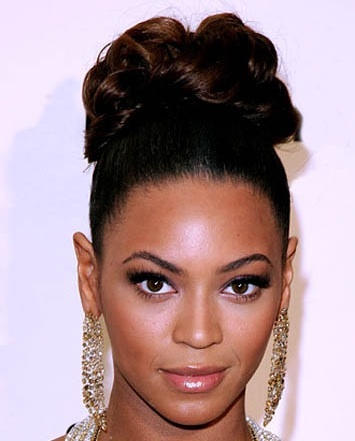 When we say this gorgeous bun on Beyonce we immediately named this the beyhive bun. We love how elegant and simple this bun is. She paired it with stunning chandelier earrings that not only compliment her skin tone but also her simple and fresh makeup. When we think of headbands we definitely think of childhood memories. Who knew that they would become a huge trend in 2015? You can keep it simple like pictured above if you’re wearing a bold print. If you want to be a bit more creative you can make your own. There are tons of youtube videos that give you step by step instructions. 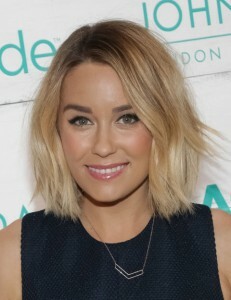 Lauren Conrad has been known for her long beach hair since her laguna beach days. She has been evolving since then and went the complete opposite and chopped it all off. She is seen here rocking a shoulder length choppy cut that she, of course, makes look super chic. Here we have a more polished/ business type look. If you are more of a corporate working woman give this flipped style a try. The mix of brown and auburn highlights give it a pop of color so it is not so bland but is also great for the workplace. Who said brunettes cannot have fun too? Here we have the beautiful Megan Fox rocking her shoulder-length brown locs. Many women think that brown is a boring color but there are so many ways that you can spice up your look. Add a pop of color to your lips, go bold with your eyebrows, or wear your favorite statement necklace the ideas are endless. This style and color is perfect for all face shapes, and skin tones. Try out a medium neck length bob. We love how the brown and orange undertones compliment each other but still contrast enough to give this look a little more edge. Because of the warm tones we think this will be the perfect look and cut for the fall. Pair with vampy wine and purple lipsticks and monochrome outfits. Are you that carefree girl? You know the girl who doesn’t like to spend 2 hours getting ready in the morning? Try this boho chic wavy shoulder length style. To achieve this look section your hair in about 8 sections and put them in loose braids to achieve the waves. 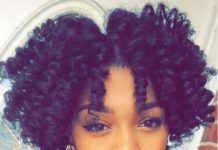 Then put each section in firm bantu knots to achieve the light curl pattern. This is very time saving because you are able to quickly take it down in the morning, fluff and go.